I'm getting into production mode with these. I'm able to make them consistently of high quality in a relatively short amount of time. The most time consuming part is having to keep sharpening my gouge. Corian is hard on carbon steel tools. I really need to invest in some higher quality tools. My wife needed a pen she could toss in her purse. I thought about getting one of the small pen kits made for wallets/pockets/purses but I hate those tiny things. So I made her one from Acorn Corian with a 24k gold slimline kit. I left the clip off since they just get in the way when in a purse. She loves it. 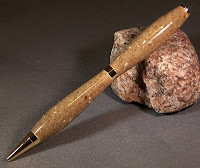 Another one made from the same kit as the above purse pen. I have settled on this profile for the bulk of my slimline pens because it seems to be easiest to write with. 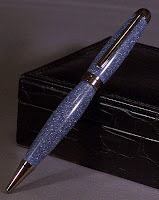 The gentle swell of the barrel from the waistband gives enough weight to the pen to balance it nicely. The weight of the Corian, significantly heavier than wood, helps with that too. If you've never written with a weighty pen, give one a shot. You'll find that your cursive flows much easier, and even if you're a block letter writer like me you will find your writing to be more legible and easier on the hand. 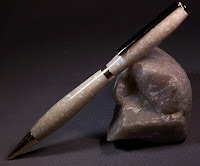 These pens, and their clones, will be for sale soon at http://www.donimages.com. I bought them from a seller on penturners.org. I just used my usual turning tools on 'em. And I don't have HSS tools, just cheapie HF "high carbon steel" tools.